When the inquest into the death of South African Communist Party activist Ahmed Timol was reopened in 2017, what struck many of those present during the hearings was the profound empathy and sensitivity of the presiding judge — the Gauteng High Court’s Selewe Billy Mothle. Timol had been killed in 1971 and most of the witnesses had aged considerably since then. Mothle was patient and tender with witnesses ranging from legendary human rights lawyer George Bizos to Timol’s comrade, Salim Essa, who had been arrested with him on October 22 1971. The apartheid wrongs that needed righting — especially for the families of the disappeared and dead who had not reached any sense of closure — appeared paramount for Mothle. Timol, Mothle found, was pushed to his death from the tenth floor of John Vorster Square and that there was prima facie evidence implicating the surviving security policemen in causing his death. His ruling has set a precedent for other apartheid-era deaths of activists in police detention to be reinvestigated and prosecuted. Mothle has been acted at the Supreme Court of Appeal (SCA) from December 2017 – September 2018. One of the matters he dealt with involved a succession dispute for the leadership of a traditional authority, between two cousins. In the case of Netshimbupfe and Another v Carthcart & Others, one cousin had been identified as the successor to lead the Tshimbupfe Traditional Community at a royal family meeting, while another was identified for the same position at a meeting of the royal council. Prior to these meetings, each would-be successor had approached the Limpopo premier to be recognised as senior traditional leader. At the time of the court proceedings the premier had not made a decision — the issue before the court was whether the application was premature and should remain in the premier’s in-tray in terms of section 12(2) of the Limpopo Traditional Leadership and Institutions Act (the Limpopo Act). Mothle, with two judges concurring held that “the essence of the respondents’ contention was to put the composition of both royal structures at the centre of the dispute”. This raised the question of who should have populated each structure, and who was entitled to be present when the traditional leader was identified. Mothe felt this “required a factual enquiry, whose answer should have been sought from customary law.” However, the full bench of the High Court had not done so. Mothle held that the notion that customary institutions must take precedence in the resolution of disputes concerning customary law does not mean that the jurisdiction of the courts is ousted. Rather, the Constitution recognises that parties may approach the courts and as such, it obligates the courts, in such instance, to apply customary law. In dismissing the application Mothle found that the application “effectively invited the High Court, the full court and this Court on appeal, to encroach, in breach of the doctrine of separation of powers, onto the terrain of the exercise of the Premier’s statutory executive authority and functions”. Judges Dambuza and Van der Merwe wrote a separate concurring judgment. The 62-year-old Mothle holds a B.Proc (1979) from the University of South Africa and an LLM (1987) from Georgetown University. In 1987 he completed a National Institute for Trial Advocacy Diploma at Harvard University. He served articles at Maluleke, Seriti & Moseneke before working as an attorney and serving as the national director for Lawyers for Human Rights from 1988-1992. From 2001, he spent nine years at the Pretoria Bar, taking silk in 2008. Over the years Mothle has worked as the legal consultant for the International Organisation for Migration, chief director of investigation as the Independent Complaints Directorate and executive director at the Independent Electoral Commission. Apartheid’s ghosts — and the injustices that continue into the present — returned during Gauteng High Court Judge Sewele Mothle’s interview, when it became apparent that so many families were still no closer to knowing what happened to their loved ones, disappeared by the apartheid state’s security apparatus, or to any form of closure. Mothle adjudicated the precedent-setting reopened inquest into the 1971 death of antiapartheid activist Ahmed Timol. His findings that Timol had been murdered by apartheid police at Johannesburg’s notorious John Vorster Square has allowed other families the legal space to uncover what happened to their loved ones — and who was responsible. But Mothle cast a frustrated shadow over any optimism his 2017 ruling would have fired up by pointing out that so many inquests — including four which were ready to be prosecuted when he handed down his Timol judgment — had not been reopened since then: “I don’t know what is happening,” he told the commission, “I was looking for the momentum from the [Timol] inquest to be retained because people need closure,” he said. Mothle added that it was urgent to follow up in these matters as witnesses were getting older, either losing their memories or dying; records were being lost and victims’ families were also dying having had no succour from the post-apartheid state. 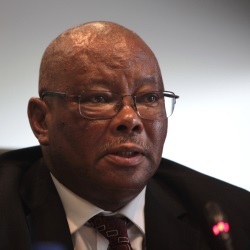 While many acting judges have floundered in the toxic atmosphere at the SCA, Mothle said he had a “soft landing” because he was “assisted by judges from Gauteng who I knew before” who “guided me through the protocols and culture”. He said there was an initial culture-shock with the “immediate conferencing” between judges after a hearing, but that he had time to adapt and overall, had found the experience “intellectually rewarding”. Mothle told the commission that he was a feminist, was against capital punishment since research had shown it was not a deterrent to crime and then cited the example of a client, an activist on death-row during apartheid, who he had assisted while working for Lawyers for Human Rights: “He had not exhausted his appeals because he didn’t have funds… and the appeal court found that he was wrongfully convicted… It is very dangerous to rush to execute people,” Mothle told the commission. It came as somewhat of a surprise that he was not recommended for appointment by the JSC.